Until the 23rd day had only influenced the distribution of points of 16 matches. Valencia and Girona are the ones that have stopped adding by the intervention of video arbitration. The VAR is about to reach the hundred interventions in LaLiga. They already have 92 in the 32 days that have been played in the championship. Eso, these actions are increasingly decisive, since the sign of eleven games has changed in the last ten days. Last weekend he did so in three matches. In the Valladolid-Getafe, Athletic-Rayo and Girona-Villarreal. In what we have been in season there have been 27 changes in the final sign of the game as a result of the intervention of video refereeing, but the technology has changed to be more influential and decisive in the last days. He has entered into decisions that have been key to the distribution of points. Eleven times in the last ten days; while he did it 16 times in the previous 22. Last weekend there was the added circumstance that the three referees who were in the VOR and corrected their teammates were González Fuertes, Del Cerro Grande and Mateu Lahoz. Three referees who doubled in their work as VAR in the last day. Policy that has been carried out by the CTA in recent weeks to give presence to the members that it considers best in such work. A policy that seems to have worked and increased the interventions to five. There were not so many in the same day since the ninth. Valencia and Girona are the two teams that have seen the most times as an irruption of video arbitration influenced the sign of their encounters. The team che has taken seven points and has given them two. The Catalans have had more luck. With the VAR they have added five more points than they would have without the technology, although this tool also did justice against them and took them two. Espanyol and Rayo are the only teams that have seen how technology affected the distribution of points against them. The parrots have added two less; the vallecanos three. On the other hand, Barcelona and Alavés are the only ones who have experienced the VAR without changing the sign of their matches. El VAR warned that Ekambi was offside when he scored Villarreal's only goal. Without technology, it would have been a 1-1 draw. Mateu Lahoz said Asensio was in an offside position when he scored in the first half against Espanyol. The VAR warned the referee and the goal ended up rising to the score. El linier nullified the 2-0 of Sevilla, it was noted that Ben Yedder was offside. But the VAR rectified the initial decision and the both finished rising to the score. The VAR acted twice in a match that without this tool had finished 2-1 and not 1-2 . In the first place, he indicated to Cuadra Fernández that the hand had not been produced outside the area, but inside and was a penalty. In the 17 ', Asensio scored a goal in the rebound of a corner, the line indicated a valid goal in the first instance, but the VAR revealed that it was out of play. El Leganés He advanced in the score thanks to the VAR warned Iglesias Villanueva of a possible penalty from Garay on Oscar. The referee pointed it out after checking it on the field monitor. Iñigo Martínez committed a penalty on Sergi Enrich. Gil Manzano, after checking it on the monitor, pointed out the maximum penalty. The goal by Raúl de Tomás did not go up to the score by hand in the control. Cuadra Fernández had to check it out on the scoreboard. Without the VAR, it would have been a victory for Rayo. De Burgos Bengoetxea warned Alberola Rojas that Garay had missed the ball in the center before Kondogbia's goal. The referee decided to cancel the goal that overtook Valencia. In the 77 ', De Burgos Bengoetxea went to the monitor after a notice from Estrada Fernández. He saw the repetition of the play and pointed to Bruno's penalty on Gameiro, whom he grabs. Bruno saw the second yellow and Getafe was left with one less. In the 92 ', the lineman annulled a goal by Godín for offside, Sánchez Martínez did not give it, but Hernández Hernandez told him that Raúl García broke the offside and ended up getting on the scoreboard to give Atlético the three points. 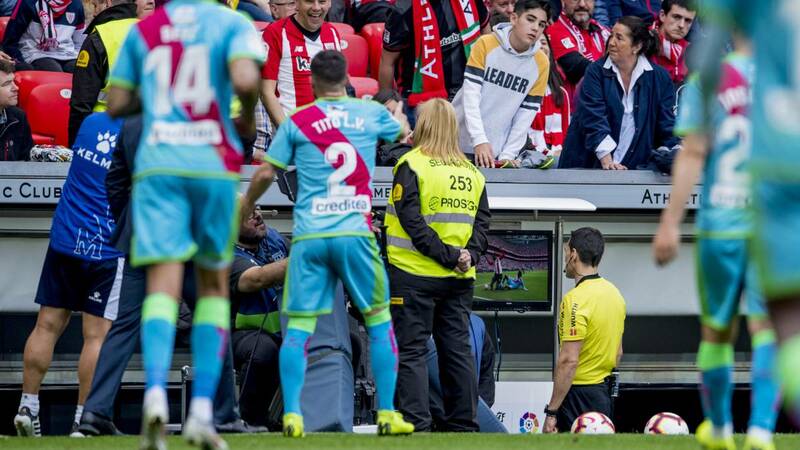 The VAR, in the first quarter of the game, annulled Etxeita's goal out of play. In the second, when Álvarez Izquierdo warned Sánchez Martínez that the goal scored by Boateng should go up to the scoreboard. The lineman had annulled him for offside. Both inteTechnology wins benefited Levante. The referee pointed out Oblak's foul on Stuani, but the action was produced within the area. The VAR warned the referee and Stuani transformed the penalty. The VAR warned Prieto Iglesias that Stuani could have helped with the hand on the goal scored Athletic. The referee went to the monitor to see the repetition and decided to annul. Without video refereeing Atlético would have left two points in his Zorrilla visit. Undiano Mallenco did not see a Kiko Olivas penalty. The VAR notified the referee and indicated the maximum penalty by the defender's hand. Griezmann transformed the penalty. Gayá committed a hand inside the area, but Cordero Vega did not notice and it was Hernández Hernández. From the VOR, the one who warned of the infraction. Without the goal, Valencia would have taken the three points and the Mendilibar table none. In the minute 5, David López committed a hand in a corner kicked by Real Sociedad. Mateu warned Del Cerro and after reviewing it on the monitor he conceded the penalty. Willian Jose scored. Without the VAR, they would have tied. While attending to Cucurella and Damián Suárez by a stroke, Estrada Fernández warned Medié by a hand of Djené in the area. Medié went to the monitor and pointed to a penalty. Charles transformed it. The VAR intervened to recommend reviewing a hand of Bardhi inside the area. Churches Villanueva came to the monitor on the recommendation of Jaime Latre and after seeing the play pointed out the maximum penalty that would transform Benzema. From the VAR they warn to De Burgos Bengoetxea that Munir was outside of game when he scored a goal in the 90th minute and that would have overtaken Sevilla. The Huesca, after this intervention, managed to score the winning goal. In the 80th minute, the referee annulled Jesé's goal for a previous offside game from Tello, but from the VAR said it was online and raised the goal of Betis. Medié did not consider that there was a penalty for Dimitrovic on Óscar Plano, but they recommended that he go to the monitor. After seeing the repetition he pointed out the maximum penalty. Green transformed the penalty. Guedes scored goal, but the VAR canceled the goal for a previous offside Gameiro. Without the VAR, the three points would have remained in Mestalla. Gil Manzano was going to point a penalty on Brais, but the lineman raised the flag because there was a previous offside. From the VAR he was informed that the Celta player was online and that the maximum penalty should be set. Aspas transformed the penalty. Kiko Olivas scored a goal, but they recommended Alberola Rojas to come to the monitor to check a possible offside positional game. After seeing the play decided to cancel the goal. Contraataque del Valladolid in which Nacho attended Valdo, who was ahead. From the VAR annulled the goal awarded by Munuera Montero. In addition to the penalty awarded and another that revoked Athletic, the VAR came to cancel the goal of Mario Suarez out of play. Stuani managed to put the tie on the scoreboard, but from the VAR they warned that there was an offside by Roberts.